1. In a medium sauce pan, add potatoes and cold water and bring to a boil. Turn down the heat to medium and cook potatoes until soft but they should still hold their shape. Put potatoes into a large bowl and mash them lightly. Leave some pieces in large chunks. 2. While you are cooking potatoes, heat oil in a frying pan on medium heat. Add onion and cook until soft about 3 minutes. Add beef and cook until no longer pink. 3. Add sugar, sake, mirin and soy sauce into the beef and onion mixture and cook for a few more minutes. Remove from heat and cool. 4. When the meat mixture is cool, add evertything - including all the liquied, to potatoes. Mix well with a large spoon. 5. Divide mixture into 10 equal portions (you can make smaller coroquettes if you like). Shape each portion into an oval shape (round, log or whatever shape you like) and put them on a plate. 6. Put flour, eggs and water, and panko in three small shallow bowls separately. Whisk eggs and water well. 7. 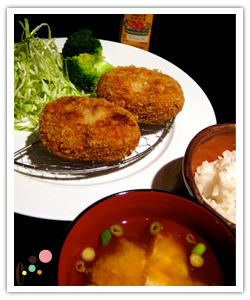 Dip croquette into flour and coat completely. Remove excess flour. Next, dip into the egg and coat them all around. And then into panko and do same. Repeat for all other croquettes. At this point, you can freeze them on a baking sheet if you wish and cook later. 7. Fry them in 350F oil until golden brown. 8. Typically, we serve them with shredded cabbage on side and Japanese worcestershire sauce (thicker and sweeter than the American kind).